The Plot: A seemingly cosmic entity called Raptar kidnaps Puma’s uncle in New Mexico and targets Spider-Man in New York. His presence also draws the attention of Dr. Strange. Puma and Spider-Man meet in Central Park, and are unexpectedly teleported to another dimension. There, they meet a tribe that worships pumas. Dr. Strange, meanwhile, frees Puma’s uncle from Raptar’s ship. After Puma decisively defeats Raptar, the heroes return home. The Subplots: The story is set during the week between Christmas and New Year’s Day. Although unseen, we’re told that MJ and Aunt Anna are visiting their family in Pittsburg. I Love the ‘90s: Puma’s uncle tells him he’s taping Babylon 5 and X-Files for him while he meditates, but he doesn’t know if Puma wants to see Xena. Later, Raptar tells Spider-Man that mindless raging went out with Texas line-dancing. Finally, Spider-Man claims that he’s playing Bill Nye, the Science Guy as he tries to figure out the ship’s teleporter. "Huh?" Moment: Puma declares that he’s now the other-dimensional tribe’s new defender, although he never elaborates on how he’s going to see them again. Review: I believe this issue marks Joe Bennett’s Spider-Man debut, even though he’s still a fill-in artist working on a few of the tittles at this time. After Steve Skroce disappears from Amazing Spider-Man, Bennett will become the regular artist as the title kills time awaiting the John Byrne revamp. I never cared for Bennett’s rendition of Spider-Man, although his work in this issue is more tolerable than what I remember from Amazing Spider-Man. 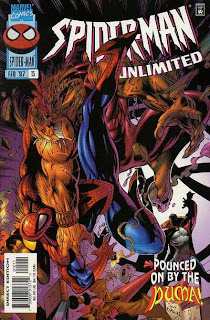 His Spider-Man at this point is heavily influenced by Erik Larsen, with a bit of Ron Lim’s look from the early Unlimited issues thrown in. It’s not great, but it doesn’t distract from the story. His Puma is surprisingly effective, making him seem truly feral for the first time in ages. Not that we’re seeing too much of the Puma’s mystic form in this issue. Tom DeFalco has decided to have Thomas Fireheart abstain from his other identity, trying to build tension for the inevitable moment when he gives in and becomes a beast. Like most of the ideas in this issue, the execution is just flat. There’s also talk of the opposing forces that created the universe, letting go of the past, new beginnings, and personal responsibility. And the idea’s tossed in that Raptar might just be Puma’s uncle in disguise, making the entire story an elaborate hoax. Honestly, none of this is fleshed out properly. The deeper themes feel tacked on, and teasing the reader with the prospect that everyone (even Dr. Strange) was fooled by Puma’s uncle just makes the entire affair feel like a cheat. The Plot: Spider-Man, still disoriented, searches for Morbius. Annoyed, MJ decides to follow him. Meanwhile, Morbius finds Dr. Andrea Janson in her ESU lab. He tells her that he needs her help to cure his blood addiction, but is soon interrupted by Spider-Man. The Friends of Humanity try to join the fight, but one is bitten and the rest flee in terror. MJ stands up to Morbius, buying time for Dr. Janson to arrive with a package of blood. Morbius leaves with Dr. Janson, while Spider-Man and MJ take the FoH member to the hospital. The Subplots: Betty is at the hospital, getting treated for wounds she received while chasing a story. Flash arrives to give her a ride home, but she refuses. I don’t believe Betty’s injuries are a reference to any published story. Spider-Man’s vertigo begins this issue. My memory is that this subplot sticks around for several months, even though it’s an awkward fit with the rest of the titles. MJ’s inner monologue has her nostalgic for the time she could hang out with Peter and their friends, before she “knew or cared about Spider-Man.” It was actually established continuity at this point that MJ always knew Peter’s secret identity. There’s even an issue of Untold Tales of Spider-Man during this era that’s based on the concept. MJ’s hair has abruptly changed in-between issues. Now it’s shoulder-length, with no bangs. She also wore this style in the Hobgoblin Lives miniseries, although very few artists will keep this look consistent over the various titles. It’s not a great look for the character, especially in this title, as John Romita, Jr. has given Betty a virtually identical style. I Love the ‘90s: The Next Issue box advises you to peel yourself away from the Nintendo 64 you got for Christmas. We Get Letters: Starting next issue, the letter column will print every single letter Marvel received in response to the Clone Saga’s resolution in Spider-Man #75. While it’s admirable that the editors would do something like this, the letters get repetitive very quickly. Review: An issue narrated by MJ, intercut with Morbius’ narration. Since character work is not Mackie’s forte, it’s not surprising that neither segment really works. I guess the idea behind MJ’s sequence is to emphasize that she isn’t going to be the docile stay-at-home hero’s wife, although having her jump off the deep end in the opposite direction doesn’t seem like much of an improvement. What exactly does she hope to accomplish, following Spider-Man around town as he chases a vampire? To Mackie’s credit, he doesn’t go for the totally predictable ending and place MJ in direct danger, just in potential danger as she stares down Morbius. (And helps to save the day just by stalling him for a few seconds.) As a reminder that MJ does have a backbone, I guess this isn’t so bad, but she just comes across as obnoxiously abrasive throughout the entire story. And Morbius, geez, he’s stuck in the same boring character crisis he had back in 1970. He doesn’t really want to be a vampire, yet he’s compelled to keep acting like one. He had an ongoing series for years and this crap was never resolved? Can’t he just move on to feeding on pimps and drug dealers or something? The Plot: Morbius preys on ESU employee Otis Wepner, a crime the ESU chapter of the Friends of Humanity blames on mutants. The Friends target Peter when he stands up to them in a café, but they’re unable to find him after he ducks into an alley. As Spider-Man, he tracks down Morbius, who is harassing Dr. Andrea Janson. Spider-Man gives her an opportunity to escape, but is bitten by Morbius. The Subplots: Arthur Stacy invites Peter and MJ to have dinner with him and Jill. Peter reluctantly agrees, but meets with Betty in a café first. After brushing Betty off to face Morbius, Peter is disoriented when he arrives for dinner, and passes out at the table. The opening scene, featuring Morbius killing ESU maintenance guy Otis Wepner, is set on the day after Christmas. This is Peter and MJ’s first meeting with Arthur Stacy. Morbius is on the loose following the events of X-Man #24. Betty wants to know how Peter feels about Flash’s problems. This is a reference to a Spectacular Spider-Man subplot that hasn’t been touched on yet, because the extended Spectacular Spider-Man arc featuring that storyline is supposed to take place after Spider-Man’s encounter with Morbius. Miscellaneous Note: Claudio Castellini’s name is misspelled as “Castillini” on the title page. 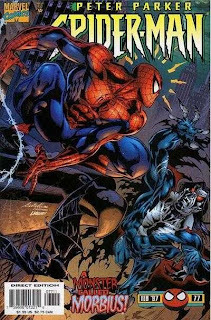 Review: I guess the outright terrible fill-in art from this era hasn’t begun yet, because Claudio Castellini isn’t a bad fit for Spider-Man at all. The issue suffers from inconsistent inking (four inkers tend to do that), but some of the pages evoke a Buscema/Palmer style, which perfectly fits the conversation scenes with Peter, MJ, and Jill. And Castellini’s Spider-Man seems to be from the Romita/Kane school, so thankfully we’re not getting another bad McFarlane impression. The Morbius storyline this issue is setting up flames out very quickly, but this isn’t a bad introductory chapter. Mackie’s dialogue is much more tolerable this issue, and while the “tension” between Peter and MJ feels forced, it’s at least a break from MJ biting her nails while Peter is off playing Spider-Man. The idea that MJ would want to get close to the Stacys while Peter just wants to avoid them is at least somewhat plausible, even if Peter comes across as kind of petulant about the whole thing. I also have to give Mackie credit for using the Friends of Humanity pretty well at this point. The anti-mutant forces rarely appear outside of the X-titles, so sticking a FoH chapter on the ESU campus is a respectable way to make the Marvel Universe feel more cohesive. And, realistically, there’s no reason why the FoH wouldn’t blame the random weirdness at ESU on mutants. The later issues I’ve read of the FoH storyline aren’t particularly good, but the concept is used well this issue. 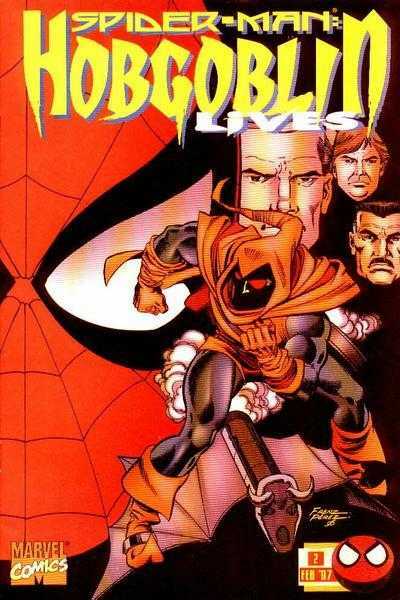 The Plot: Jason Macendale is convicted of the Hobgoblin’s crimes, but on his way out of the courtroom, publicly names Ned Leeds as the original Hobgoblin. Later, Macendale is killed in prison by the original Hobgoblin. The Hobgoblin then visits “Roderick” Kingsley, forcing him to revive their previous working relationship. 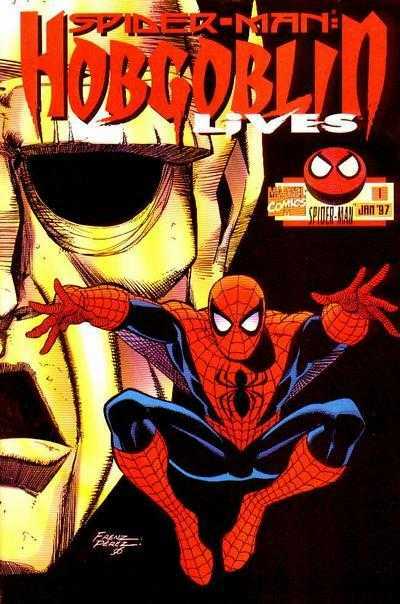 Review: I’m only going to do capsule reviews of the Hobgoblin Lives limited series, largely because the behind-the-scenes details relating to the Hobgoblin’s true identity, and the tangled continuity that surrounded the original mystery, have already been covered extensively by others. Comic Book Legends Revealed did a far better job than I could ever do, so check those articles out if you want to learn more. The first issue largely serves as a reintroduction to every Hobgoblin suspect from the early ‘80s, and as an argument against the “proof” that Ned Leeds was truly the Hobgoblin. Neither of these elements is going to be a perfect fit; most of the Hobgoblin suspects had disappeared over a decade earlier, and no one in the comics ever seemed to doubt Ned’s role as the Hobgoblin. 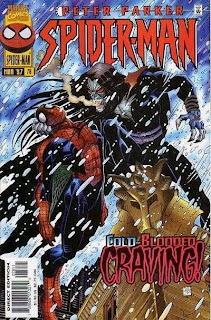 The editors tried to make the reintroduction of the forgotten characters less abrupt by sneaking them into various Spider-Man comics leading up to this series, which is really all that they could’ve done. Regarding Ned Leed’s exoneration, Stern hinges it on the idea that the super-powered Hobgoblin couldn’t have been killed by four ordinary assassins. That’s not necessarily true, and it’s certainly odd that it’s Mary Jane who suddenly develops this theory. 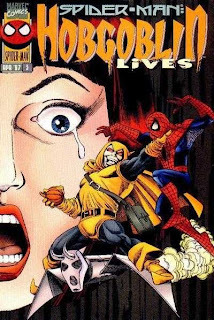 However, what makes the Ned Leeds fake-out more palatable is knowing that another person, Lefty Donovan, died while posing as the Hobgoblin years earlier. So there is a precedent for the Hobgoblin setting doppelgangers up to be killed in order to cover his tracks. Revealing that Ned just happened to be the latest isn’t much of a stretch at all. For fans of the original storyline, this limited series has to be a treat. Not only is Roger Stern revealing the Hobgoblin’s true identity, he’s also bringing back all of the old suspects and taking in a lot of disparate Spider-Man continuity to deepen the mystery. (This has to be one of the very few times Terry Kavanagh’s Web of Spider-Man run was acknowledged by another writer.) Fans who missed the original issues probably won’t get nearly as much of it, even though this is still an engaging Spider-Man story with great art. My only real problem, as a reader who only knew Jason Macendale as the Hobgoblin, was his pathetic death scene. I was already kind of annoyed with some writers’ insistence that Macendale was a perennial loser, but it’s even more irritating to see him killed off in a flagrant attempt to build up another character. The Plot: Spider-Man asks Betty Brant-Leeds and Flash Thompson to help him investigate the Hobgoblin’s true identity. Meanwhile, the Hobgoblin strikes an Osborn industrial plant. After Betty makes a public announcement that she’s found her late husband’s personal notes, she’s confronted by the Hobgoblin. 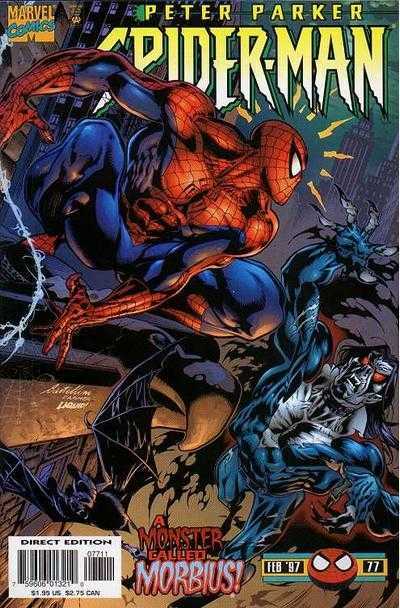 Spider-Man engages him in a fight, and is left for dead in the East River. Review: Another issue spent recapping the established clues and teasing various characters as potential Hobgoblin(s). Former Bugle writer Jacob Conover is the preferred red herring this issue, as Stern reminds everyone that he hated Ned Leeds and was involved with stories connected to the Hobgoblin back in the day. Jacob Conover would’ve been a terrible choice as the Hobgoblin, but honestly, not much worse than the actual culprit we’ll discover in the next issue. The real highlight this time is Frenz’s art; there are some truly fantastic shots of Spider-Man and the Hobgoblin this issue. The Plot: Spider-Man swims out of the river and eventually locates the spider-tracer hidden in Betty’s tape recorder. Before he arrives, Hobgoblin confesses to Betty that he brainwashed Ned and used him as a doppelganger to cover his activities. When he grew bored with crime, he had Ned killed. 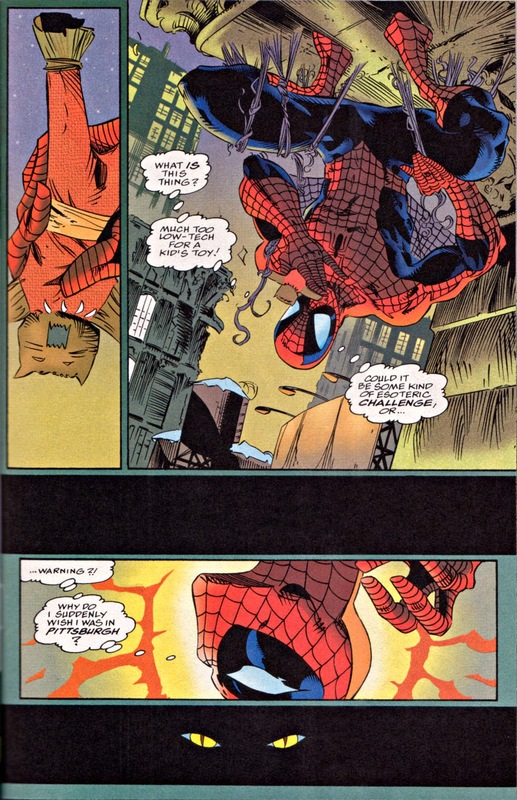 Spider-Man arrives and eventually unmasks the Hobgoblin, revealing him as Roderick Kingsley. Meanwhile, Betty discovers Kingsley’s brother Daniel has been impersonating Roderick. The Kingsley brothers are placed in jail, enabling Peter and his friends to move on. Review: And here’s the grand reveal…the Hobgoblin is a long forgotten minor character from the early ‘80s that practically disappeared after Roger Stern left the books. Not knowing who Roderick Kingsley was at all was kind of annoying (from my perspective as a snotty teenager), but I can’t imagine that the fans who actually remembered Kingsley were thrilled with this revelation, either. Having recently read Kingsley’s first appearances in the Spider-Man Legends: Roger Stern trade, I now know that the guy’s about as intimidating as Barry Manilow. On a gut level, it just feels like a trick. However, the idea of a corrupt fashion designer stumbling across the Green Goblin’s gear and kind of cheating his way into super-villainy does sort of sound like a classic Marvel premise. The Red Skull was once a bellhop, after all, so maybe this isn’t so ridiculous. The revelation that the “Roderick Kingsley” we saw in the first issue was actually his brother in a toupee, however, that one I’m not going to forgive. Kingsley’s brother was only mentioned once during the original storyline, so while it’s somewhat admirable that Stern planted this seed a long time ago and finally got to pay it off, it just feels kind of cheap. The bad guy is covering his identity with a brother, who happens to look exactly like him, even though they’re not twins and he’s somehow ended up with a baldness gene that skipped Roderick. I believe Tom DeFalco knew about this original plan during his stint as writer and he nixed it because it didn’t feel as if Stern was playing fair with the reader. I’ll side with DeFalco on this one. That said, I don’t want to give the impression that I hated this miniseries. I actually thought it was a lot of fun; the big revelation is more of an annoyance than anything, since I have no investment in the original mystery. And you’ve got to give Stern credit for the amount of research he put into the project, and for all of the ways he’s able to justify several writers’ continuity and make all of this feel like a coherent story. This is also one of the best-looking Spider-Man projects released during this era. It’s a shame that Ron Frenz wasn’t asked to do more Spidey work during these days (especially considering the numerous fill-in artists that were brought in, none of them as good as Frenz). Just imagine a Ron Frenz/George Perez run on one of the Spider-titles during this era, instead of some of the imitation Image stuff that kept coming out. I would like to know the story behind the gigantic, off-model spider-emblem on Spider-Man’s chest, though. That’s the true mystery. Summary: After Batman electrocutes Lady Clayface, she reveals to him that the Abattoir kidnapped her baby after he discovered their hideout. He’s ordered her and Clayface to kill Batman and kidnap Graham Etchison before they can see their child again. Batman races to Clayface and Abattoir’s meeting place, just as Clayface turns on Abattoir. Their fight is interrupted when Clayface’s son attempts to grow wings and fly off the nearby fire escape. Batman is forced to allow Abattoir to escape in order to rescue the baby. Clayface is taken into custody and his son is sent to STAR Labs. Review: Okay, five issues later and Abattoir is still on the loose? This is ridiculous. I think it’s fairly obvious that Grant has no interest in this Abattoir storyline, and is merely using him as a plot device for the Baby Clayface story he was going to tell anyway. Judging the Shadow issues on their own, it’s actually a defensible move, since Abattoir’s story has nothing to do with this book and he’s capably filling his role as the true villain that’s brought the Clayfaces back into crime. But if you’re trying to read the entire Abattoir arc in its entirety, watching him constantly get away is just tiresome. Regarding the Clayface story, I think Grant is still doing a admirable job of giving the relapsed villains some depth, and I guess Bret Belvins’ Baby Clayface is kind of cute. I don’t know if this arc is typical of Shadow, which I assumed to be the “gritty” more realistic Batbook, but I enjoyed it. Summary: While searching for the Abattoir, Batman is ambushed by Lady Clayface. Meanwhile, Clayface invades a therapy session Leslie Thompkins is holding for the children who witnessed the Abattoir’s fight with Batman. He demands Graham Etchison turn himself over. While fighting Batman, Lady Clayface flashes back to her life with Clayface. She recounts Clayface’s escalating pain, which can only be alleviated by touching another person and passing his contagion on. During a respite from his pain, she was impregnated. Following her flashback, Lady Clayface regains the upper hand on Batman. Irrelevant Continuity: The Clayface in this story is Clayface III, Preston Payne. Total N00B: My only knowledge of Clayface comes from the ‘90s animated series and the recent video games. Consequently, any image of Clayface with an oatmeal can head and supervillain cape just looks wrong to me. 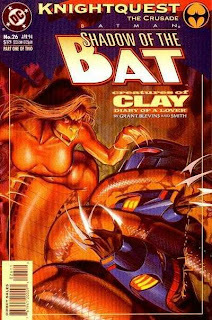 And I have no idea who Lady Clayface is. Review: This Abattoir storyline certainly has its share of detours, doesn’t it? 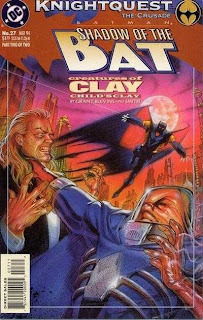 Alan Grant has apparently been roped into the Batman arc (which even Doug Moench doesn’t seem too enthused about finishing), and has decided to use it as a springboard for…a Clayface/Lady Clayface story. Sure, whatever. The second chapter of the story makes the connection clear, but at this point, the Clayface material comes across as a totally arbitrary diversion. However, even as a diversion it’s still more entertaining than anything directly related to Abattoir. Grant does a good job of making the Mr. and Mrs. Clayface sympathetic characters; more sympathetic than the person who’s actually Batman at this point, to be honest. And the mystery of why they’re simultaneously trying to kill Batman and kidnap Abattoir’s cousin makes me curious enough to read the next issue. So far, this is the best Shadow issue reprinted in the Knightfall books. Summary: The Malevolent Maniaxe burn down the warehouse, forcing Batman and Ballistic to rescue the unconscious smugglers while they escape. Batman and Ballistic then travel to a nightclub owned by Raf Luxor, another figure from Abattoir’s past. They run into the Maniaxe again, and during the melee, Luxor is killed. Batman forces one of the Maniaxe to reveal who placed the hit, which leads to Batman and Ballistic confronting Henry Etchison’s lawyer. Batman takes a list of Henry Etchison’s properties from the lawyer, while Ballistic collects the bounty and decides to leave Gotham. The lawyer is left for the police as Batman continues to hunt the Abattoir. Total N00B: I can only assume that Raf Luxor played a role in the previous Abattoir storyline. Review: Thankfully, this moronic digression with Ballistic and the Maniaxe is over. Even though there’s a lot of running around, the plot’s barely advanced as the same characters just end up confronting each other under the same conditions, followed by more pointless fight scenes. Ballistic exits the story when he simply steals the blood money without completing the job, contributing absolutely nothing to the plot. If this was supposed to be the showcase that decided whether or not Ballistic got his own series, he didn’t fare any better than Joe Average or whatever the last loser’s name was. Moench does virtually nothing to make the character likeable or even slightly interesting. As a straight man for Batman’s cruel, dismissive one-liners, he’s good for one solid joke throughout the entire storyline. Having accomplished that, he needs to be returned to Extreme Studios. And, ugh, there’s more of the Malevolent Maniaxe to tolerate this issue. Painfully unfunny and just flagrant page filler, I pray that no one revives them before this event is over. Summary: Graham Etchison’s father orders a hit on the Abattoir from prison, attracting Ballistic and the punk group turned street gang, the Malevolent Maniaxe. 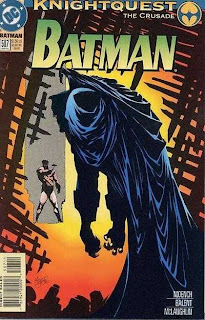 Batman searches for the Abattoir by tracking down his former accomplices, a plan that puts him in the path of the Maniaxe. They meet at a warehouse, where the Maniaxe pick a fight with a group of smugglers. 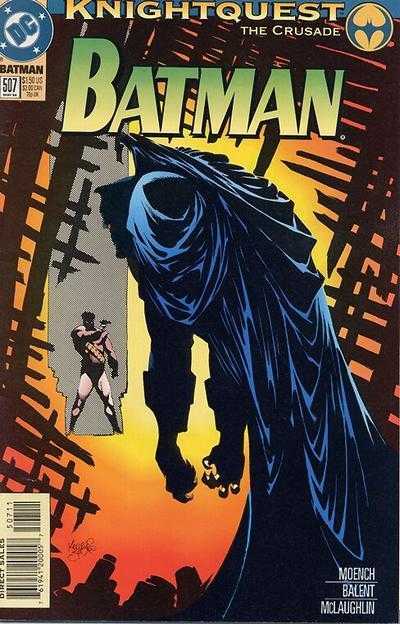 Shortly after Batman enters, Ballistic crashes through the wall. Ballistic is another enduring creation from DC’s “Bloodline” annuals. 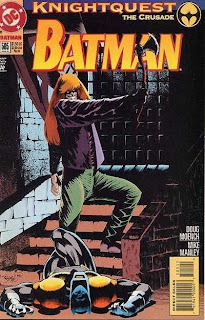 A few subplot scenes remind us that Mayor Kroll is still pressuring Commissioner Gordon to support Batman’s new tactics, Bruce Wayne has rescued Tim Drake’s father but now must find Shondra (none of these events ever appear in this reprint collection), and Tim Drake is continuing his career as Robin without Batman. 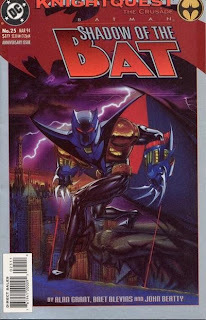 Batman must physically return to the Batcave to retrieve his files on the Abattoir, ignoring the updates to his costume that have already occurred in Shadow of the Bat #25.
Review: After conveniently forgetting about the Abattoir for the entirety of Shadow of the Bat #25, Batman has returned to this critical mission. And he’s joined by some of the lamest characters to wander into this storyline so far. Ballistic is an ex-cop who now takes mercenary jobs to make ends meet, but feels obligated to only take out the people who deserve it. This might sound like a respectable premise for a new character, but Ballistic looks like such a dumb collection of ‘90s clichés it’s impossible to take him seriously. (OMG! Prime’s gone tribal and stolen Cable’s guns!) I don’t know if he was intentionally designed as a Rob Liefeld parody or not, but placing him in a Batman story just doesn’t work. The other new characters congesting the story are the Malevolent Maniaxe, a dimwitted group of failed musicians turned criminals. The joke is that they’re a punk band that looks and acts like the Three Stooges…a joke that Doug Moench doesn’t tire of, even though he runs it into the ground three pages after their debut. Three Stooges tributes used to periodically show up in mainstream comics, although I don’t recall ever laughing at any of them. That brand of slapstick doesn’t exactly translate into a series of static images, and honestly, what on earth is a Three Stooges parody doing in the middle of a story about a serial killer methodically murdering every member of his family? Summary: The Corrosive Man escapes from prison, seeking revenge on Mort Kadaver. Meanwhile, Batman advises new hero Joe Public to retire. Joe intercepts a police band announcement of Corrosive Man’s escape, and soon joins Batman in battle. Batman orders Joe Public to absorb Corrosive Man’s powers, then buries the villain in sand. Batman again advises Joe to quit before returning to the Batcave. There, he designs a new costume. Joe Public first appeared in DC’s “Bloodline” annuals. He’s a high school gym teacher with absorbing powers. I have no idea if he’s intended to be a comedic character, but Alan Grant seems to view him as a joke. Batman’s stated reason for developing a new costume is to develop an acid-proof cape, and a way to remotely access the Batcomputer. 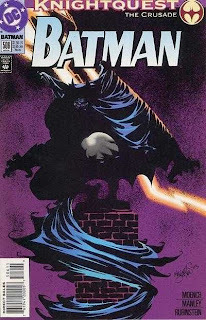 In the previous installment, Batman drew up plans for a new cape that could work offensively, following his inconclusive battle with the Abattoir. I Love the ‘90s: Remotely accessing a computer is treated as a technological impossibility. Batman has to develop advanced technology and program it into his helmet in order to access the Batcomputer’s files while patrolling the city. Total N00B: I had no idea who Corrosive Man and Mort Kadaver were before reading this issue. After reading it, I have a vague understanding that Mort Kadaver is somehow responsible for Corrosive Man’s condition, although I still have no idea who Mort is or what he looks like. Review: For the second time in two months, Batman’s inspired to draw up plans for a new costume. Because Shadow of the Bat happened to be hitting an anniversary issue this month, it’s been selected as the debut for Batman’s new look. And there’s not much to it, is there? His mask is now a helmet, his gloves have red laser sights, and I suppose there’s some minor redesign of his cape. Given the weak rationale for the new look within the story, I can only guess that the new costume was conceived as a way to maintain publicity as the overall “Knightfall” event marched along. While Alan Grant seems as apathetic towards Jean-Paul as ever, this issue does at least see the return of Bret Blevins as penciler. Blevins does a lot to sell the horror movie feel of the story, and his interpretation of the Corrosive Man looks like a genuine monster. There’s nothing anyone could do about Joe Public, however. The guy looks like he should’ve been one of Hammer’s back-up dancers on this “2 Legit 2 Quit” tour. Baseball hat, giant sunglasses, bulky leather jacket…DC was still trying to push this loser during the height of grunge, for crying out loud. How could anyone think this was a good idea? A charitable reading of Joe’s dialogue would lead you to believe Alan Grant is intentionally treating the guy as a joke, but that doesn’t make his presence any less annoying. Summary: Batman, while investigating the murder of a family, is suddenly beset by images of his father and St. Dumas. They argue over Jean-Paul’s loyalties, and eventually St. Dumas stabs his father. The vision ends, and Batman proceeds to investigate the murders. He deduces that the killer is Arnold Etchison, the Abattoir. Abattoir targets members of his own family, leading Batman to follow Abattoir’s cousin, Graham Etchison. Etchison is attacked by Abattoir while doing charity work with orphaned children. Batman rescues Etchison and the children, but is forced to allow Abattoir to escape. The Abattoir first appeared in Detective Comics #625. (An “abattoir” is a slaughterhouse, apparently.) As far as I can tell, in his previous appearances, Abattoir’s cousin Henry Etchinson used Abattoir to kill his wife. Graham Etchison is Henry’s son. While talking to the image of St. Dumas, Jean-Paul defends his father by saying that the System brainwashed him into becoming a killer. I have no idea what he’s talking about, but it's possible this is material covered in the original Sword of Azrael miniseries. Following his battle with Abattoir, Batman declares that he needs to upgrade his costume. Using the System for guidance, he begins to design a new costume on the final page. The footnote on the final page says the story is continued in Shadow of the Bat #26. The next story reprinted is actually Shadow of the Bat #25, which will present a different motivation for Batman’s new costume. I Love the ‘90s: One of the police officers arriving at the Abattoir’s murder scene references Unsolved Mysteries. Review: The Abattoir is another one of the serial killers introduced in the Batbooks back in the late ‘80s/early ‘90s. I’ve never heard of him before, and don’t see anything in this issue that elevates him past generic “grim and gritty” status. His gimmick is that he murders members of his own family, and at this point in his career, he’s down to his cousin’s children. Moench uses Abattoir’s family issues to segue into Jean-Paul’s own family problems, although this is all very vague for anyone unfamiliar with the Sword of Azrael miniseries. (Or maybe it's intentionally vague?) The recurring appearances of Jean-Paul’s father and St. Dumas as hallucinogenic apparitions are getting old at this point, to be honest. It’s already obvious that Jean-Paul is unbalanced, we don’t need to see him hallucinate repeatedly to get the point, and whatever character drama this is trying to develop just feels stale. The Punisher is a dark, driven vigilante with a psychological profile worth exploring. Jean-Paul Valley is a lunatic brainwashed into continuing the Crusades (or something) since childhood. It’s hard to develop empathy for the character, and he rarely brings anything interesting to the stories. Plus, his “dark nature” seems to be an excuse for the writers to keep wheeling out these monotonous serial killer villains, and that’s also getting old fast.